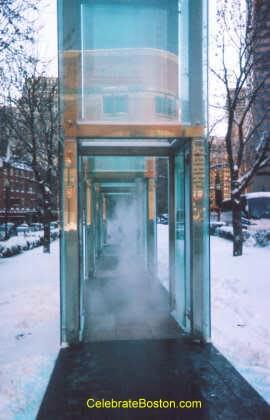 Along the Freedom Trail, just past Faneuil Hall, is the New England Holocaust Memorial. Historically, sixty years ago, the Nazis killed about six million Jews. The Nazis had also persecuted or murdered many millions of others including Romas, Poles, Slavs, Soviets, homosexuals, communists, trade unionists, political or religious dissidents, and people with special needs. This was an unprecedented act of genocide in human history. The memorial is comprised of 6 fifty-four foot glass towers. They represent the major Nazi concentration camps: Majdanek, Chelmno, Sobibor, Treblinka, Belzec, and Auschwitz-Birkenau. Each tower is illuminated from the top and bottom. There are six million random numbers etched into the glass, from one to six million. Smoke rises from the base inside each tower, which is quite visible during cold weather. Less known about the towers, is that in low winter direct sunlight, one can reach behind the glass and the numbers will reflect onto your hand or arm. The Nazis had tattooed numbers on the wrists on those captured and sent to the concentration camps. These tattoos were permanent reminders of any one that were fortunate to survive the camps. The New England Holocaust Memorial arouses memories of a very tragic period in human history. Boston was, and still is, a melting pot of many cultures and immigrants from all over the world. Jews had immigrated to Boston starting in about the 1830s, with some racism inflicted in the late nineteenth century (similar to what the Irish and Italian immigrants had experienced as they moved here also). Boston had Jewish neighborhoods in the old West End district, on Blue Hill Avenue, East Boston, and in Chelsea, MA during the early 1900s. 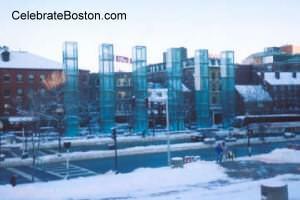 Walking Directions: Exit the station and walk toward Boston City Hall. Stay to the left of the building, and the memorial is on the other side of the plaza at the bottom of the stairs.